The Angriest: Star Trek: Voyager: "Cold Fire"
It is 13 November 1995, and time for another episode of Star Trek: Voyager. 10 months after Voyager was thrown into the Delta Quadrant by the mysterious "Caretaker", the crew encounter that now-dead creature's former mate - now the guardian of an isolated colony of Ocampa. Kes (Jennifer Lien) is excited to meet members of her own race, but joy soon turns to fear as these isolated Ocampa are revealed to be less benevolent than they appeared, and the second Caretaker a far more dangerous force than Captain Janeway (Kate Mulgrew) had hoped to meet. "Cold Fire" is quite a surprising episode. The series premiere gave the series a convenient hook: the Caretaker that dragged the USS Voyager to the Delta Quadrant died before he could return them home, but before dying he mentioned a former mate somewhere else in the Quadrant that could potentially do the task as well. It felt like a convenient bit of foreshadowing. Whenever it was determined an appropriate time for the ship to get back to the Federation, it could encounter the mate and achieve that. It felt like something that was going to happen in the series finale some years hence, not halfway through the second season. Despite that, here we are. The bulk of "Cold Fire" is a classic temptation story. Kes has been training to improve her telepathic abilities with Lieutenant Tuvok (Tim Russ), and the episode's opening scene establishes both her potential and her lack of focus. When Kes meets the inhabitants of the Ocampa colony (well, inhabitant - budget savings mean we only meet one, played by Alien Nation's Gary Graham) she is shown the full range of abilities she might manifest, were she to simply abandon Voyager and live there with them. Her abilities soon run wildly out of control, destroying her arboretum in one scene and almost killing Tuvok in another. The latter is unexpectedly graphic for Voyager, tying rather effectively in the other half of the episode. That other half is, put simply, something of a horror story. Janeway is desperate to contact the second Caretaker for help, but when contact is made she discovers that this second Caretaker blames the Voyager crew for the death of the first. It leads to a properly horrifying moment in Voyager's engineering section, and a nicely tense climax. 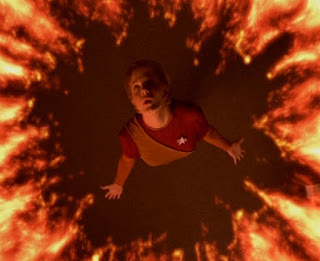 The episode concludes with Voyager escaping, but the potential remains for the second Caretaker to return (spoiler - she doesn't). This is likely the best episode of Voyager's second season to date, because it develops the lead characters well. It's a great episode for Kes - and nicely foreshadows some of her later telepathic abilities - but is also draws Neelix (Ethan Phillips) in rather well as he too considers both leaving Voyager and Kes' growing skills. It firms up Kes' relationship with the Doctor (Robert Picardo) and particularly Tuvok. Tuvok rarely gets decent material, and he gets some great stuff here that Russ plays very well. After some truly dreadful episodes this season, it's refreshing to get such a good episode to make the whole journey worthwhile. It's the fifth good episode out of 10, bringing the quality ratio up to an even 50 per cent.